By now I hope you have a better sense of what Networking 2.0 is and how it can best benefit you. So as the second part of this four part series we will be discussing critical things to do before a networking event! Missed the first part of Networking 2.0? Need a refresher? Take a look: How to Best Network in 2013: Networking 2.0 Style- Part 1. There are a few things you need to remember and do when you network before an event. 1) Know who you are and know what is already being said about you ie Google yourself. This will let you know how much work you have to accomplish #2. 6) Start Connecting online and offline with people that have the same goals and more importantly those that have already accomplished what you are looking to accomplish. Why? Well let me explain. Knowing who you are is crucial and beneficial for both you and the people at networking events. A tool that Joselin, BostonTweetUp co-founder, has successfully used is the Kolbe A index (aff link). IQ tests tell you what you can do. Personality tests tell you what you want to do Kolbe A™ Index measures what you WILL or WON’T do. Only about 5% of people are as good as you are at what you naturally do best. This Index allows you to determine what that is. Key Takeaway: You will be much more successful and have less competition in your business career if you focus on what you naturally good at. Knowing where you want to be/go is critical because there are people at networking events that can help you get where you want to go. Key Takeaway: The secret to getting what you want fast, is to first know where you want to go and realizing that there are people that will help you get there. Setting S.M.A.R.T. goals gives you a framework to make your dream career into a reality. During this process you will also know who would be the best person to help you achieve your goal. The ideal person that will get you to your goal much faster. You should also know what you are willing to provide in exchange for the guidance. Remember, It’s not what you know, it’s who you know, so make sure you are prepared to provide something great in exchange for the assistance you get! Key Takeaway: Giving yourself a deadline will help you focus on what you need to do daily to accomplish your goals. Creating a game plan will determine when you arrive, how long you stay, how to dress and what to say to everyone you meet. Key Takeaway: To have a successful career takes a lot of work, however it is much better to work smart with a plan and people vs just working hard. Updating your online persona says a lot about you. Why? Because you are a brand. So everything you share across any social media platform defines who you are! So make sure you are representing yourself well! Key Takeaway: Invest in your online persona as it will act as your 24 hr / 7 days a week promotional tool for you and your brand . Start connecting before the event can prepare you on what to say and who to talk to. Reviewing online profiles can help you know the people that have signed up for the event so that you know whom to look for while you’re there. Key Takeaway: Relationships take time to build the sooner you get started the better. So now you have an advantage! Want more? 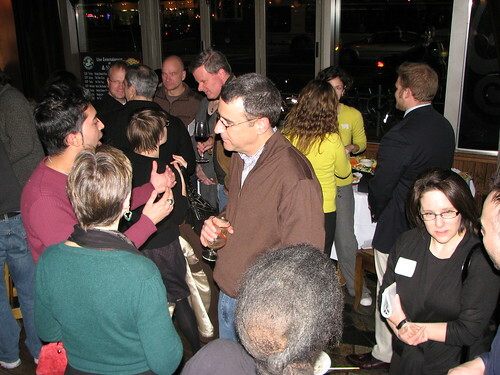 Take a look at the Networking 2.0 Series on BostonTweetUp’s Youtube channel. Our co-founder @Joselin has some great tips for you. Next week we talk about what to do during a networking event. I hope this post helps you feel more comfortable on what to do before any networking event. But if you still have questions or any additional suggestion, leave your comments below! We want to help you out as much as possible!